Is accumulated annual leave applied towards service credit? Unused accumulated annual leave isn’t applied toward service credit. However, some tiers may include payment for up to 30 days of unused vacation in your final average salary (FAS). For more information, please check out our Final Average Salary page on our website, or check out your retirement plan booklet on our Publications page. How is sick leave calculated for Instutional Teachers? Your additional service credit is determined by dividing your unused sick leave days by 260. To get account-specific information, you can email our customer service representatives using our secure email form, and one of them will review your account to address your questions. Filling out the secure form allows us to safely contact you about your personal account information. Please allow five to seven business days for a response. 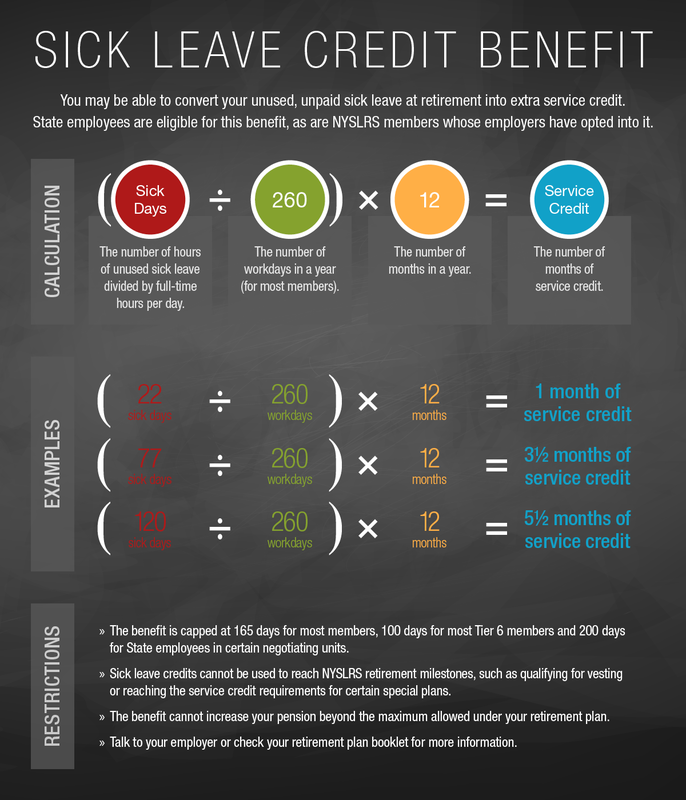 The NYSLRS sick leave credit benefit converts unused, unpaid sick leave into service credit, so the limit is a number of days (up to 165 days—7½ months—for most ERS members), not a dollar amount. Some employees have a benefit that allows them to convert unused sick leave into a health insurance credit, however NYSLRS doesn’t administer health insurance benefits. If this is the benefit you’re asking about, you should check with your employer about any limits. If you have questions about a NYSLRS benefit, we recommend emailing our customer service representatives using our secure email form. One of our representatives will review your account and respond to your questions. Filling out the secure form allows us to safely contact you about your personal account information.